We are pinching ourselves that we are here. This city dates back to 1519 and despite 50 years of withering neglect, it is still stunningly beautiful. And so, when we travelled from Cancun (Mexico) to Havana we really didn’t know what to expect. Never having visited a communist country before we had images of stern and unfriendly Customs officers with lots of facial hair and dark sunglasses and as such we were not prepared for the sight of attractive young girls dressed in very short Customs uniform skirts and fancy pantyhose (including holes) after we “deplaned” (a term picked up at Dallas Airport*). We were greeted by a representative from the local travel agent responsible for our 10-day tour of Cuba. 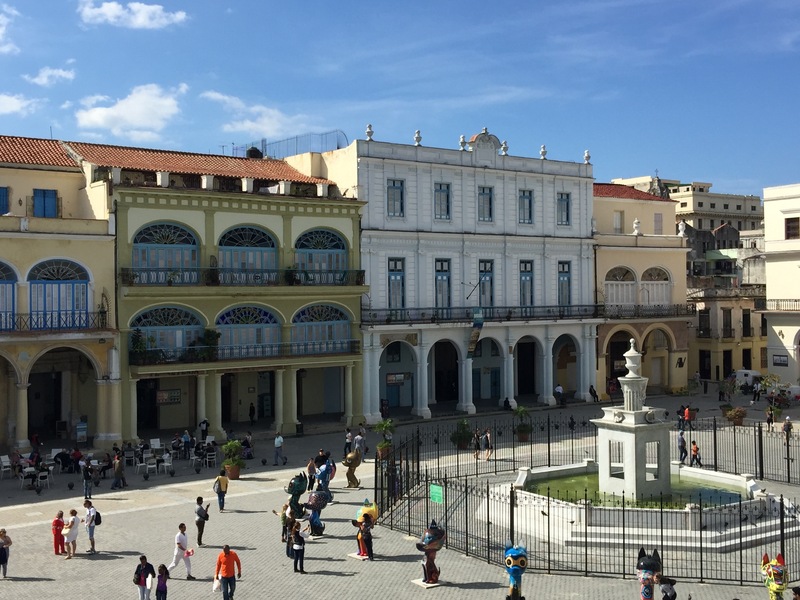 English is spoken widely in Havana and in other major tourist destinations such as Trinidad and in restaurants and bars, but if you venture out further, you will need to have a rudimentary knowledge of some Spanish. As we arrived at 11 pm, it was dark and we did not see much on our way from the airport to our hotel which was situated in a pedestrian square complete with ancient church, pigeons and modern sculptures. Our hotel turned out to be a palace in a former life and as with most hotels and houses, has an internal courtyard. Our welcome drinks were the first of many Cuba Libres and Mojitos we happily consumed during our 10-day stay. 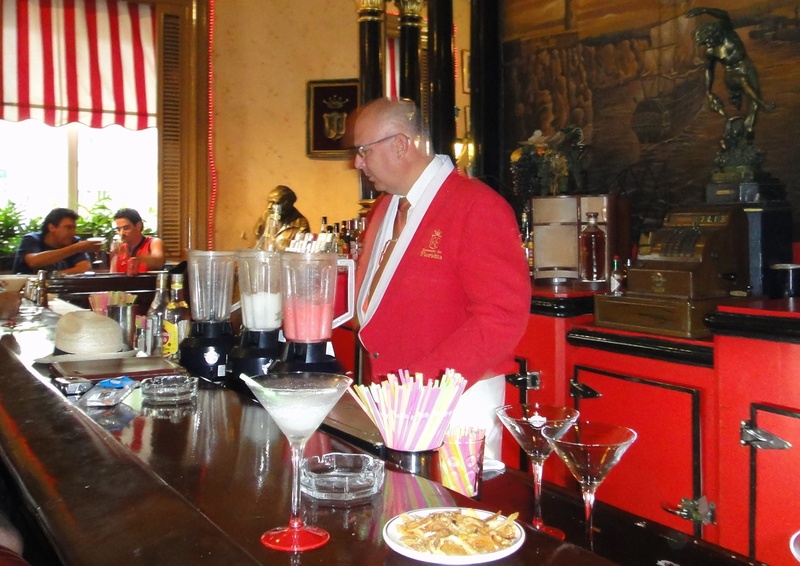 Havana Club rum (Havana Club factory museum 100m from hotel) is smooth and leaves you yearning for more – a yearning which we did our best to satisfy. It is not unusual to refill your glass with rum at the bar if the melted ice has somehow made the drink unbearably weak. The next morning we try to get our head around Cuban’s monetary system. There are CUCs (pronounce “cooks” or referred to as “dollars”) and CUPs (pesos). The latter are used by Cubans only – it is the currency they are paid in and the currency they use to buy their food and essentials. There are approx. 25 pesos in a CUC. CUCs are used by tourists and is the only currency you will be able to get. Money exchange is either at the airport or at a bank. Go early in the morning as there will be queues outside as they only let a limited number of people in at any one time. Wifi is only available in public places such as squares, busy pedestrian streets and restaurants. You will need to buy a phone card for a certain amount of online time. They don’t always work and connection is slow, so don’t rely on it for all your travel arrangements. Hotels generally do not have public wifi in the rooms. Our tour guide arrives on time at our hotel, is courteous and very obviously checking us out just as we do him. It is raining lightly but our walking tour through Havana is nonetheless impressive. Occasionally we stray from the tourist trail and end up in the much poorer residential streets, where decay, ruin and seemingly unsafe housing is abundant. But then you turn a corner and find a trio of old-timers playing Salsa music as if they are in their teens. Tourists and locals alike join in a spontaneous dance in the street. Women dressed in colourful frocks and headdresses are smoking 60-ring cigars and for a couple of CUCs you can have your photo taken with them. Within walking distance is the Hotel Ambos Mundos where Hemingway lived for seven years in the 30s. For a small fee you can view the 5th floor corner room where he started writing his novel For Whom The Bell Tolls in 1932. Take the cage lift to the rooftop terrace and you’ll have a wonderful view over the Old City, all the while enjoying an early morning Mojito. Just down the road is El Floridita, an historic fish restaurant and cocktail bar and once the favourite hangout of Ernest Hemingway. 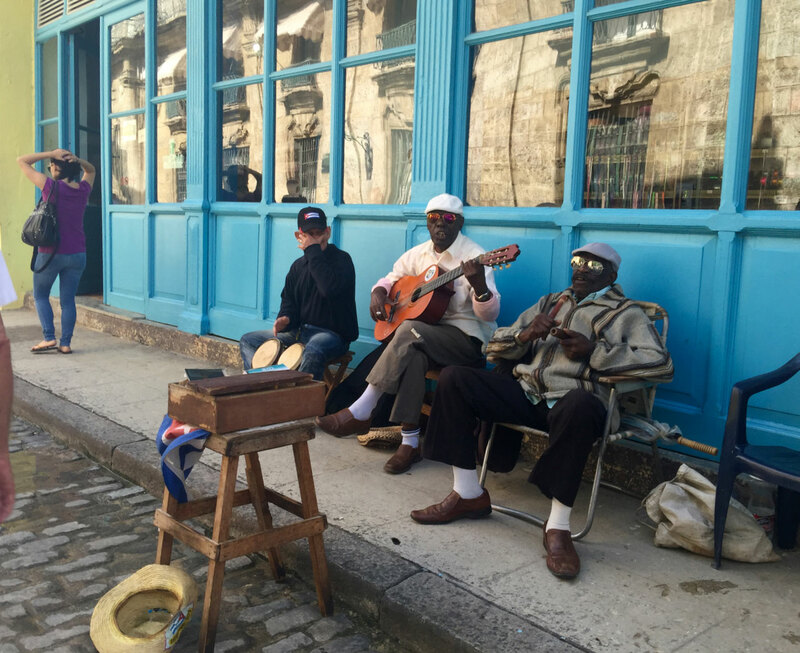 Famous for live music and frozen daiquiris, when you walk into the bar you are instantly transported back to the 1930s – it is genuine and lively, and be prepared to be surrounded by the fumes of cigars and live salsa music. 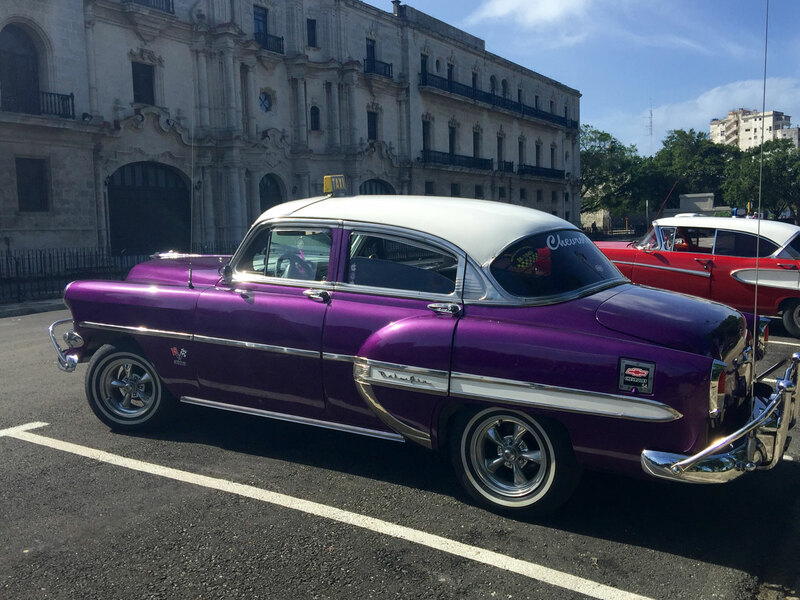 What has made Havana – and Cuba – famous are the retro cars that have been driving around since Fidel in the 60s stopped car imports from western sources into Cuba. You feel like walking around in a car museum – they are everywhere! Some have been restored to pristine condition, and some look like a miracle on wheels to be still driving around. A tour through Havana in one of these cars is an absolute must and drivers are only too willing to offer you a tour. We visited Republic Square where Fidel once famously held a 6 hr speech. I’d go for the abridged version. 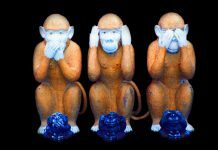 There are no annoyingly persistent attempts at recruiting you into their cars – a polite “No, thank you” is all that is needed. If you take a tour of 2 hours you will be able to see those parts of Havana that go beyond the Old City and into the residential areas. Our taxi driver, a friend of our tour guide, is a qualified medical doctor – a diabetes expert in fact – who has retreated from his medical profession of 20 years in order to drive a taxi. Reason? He was earning the equivalent of US$70 per month paid by the Cuban government and never seemed to be able to get ahead. Average monthly wage in Cuba is US$25. He is now driving his taxi and earns an average of US$500 a month. Our tour guide, in fact, is a naval engineer – highly educated people but finding they could not get ahead on a Government pay. It is a story heard all too often around Cuba. People on welfare get a ration book for things such as soap, fruit, vegetables and eggs (7 per month). Our tour guide had never tasted an apple until he was 14 years old. We gave him as many apples as we could smuggle out of our hotel dining room. Cuban cuisine is fine as long as you like pork or chicken, black beans and rice. They do the best they can with limited means and we’ve had some wonderful home-cooked meals. Beef is a luxury bestowed on very few and isn’t available in any of the hotels we stayed. Contrary to what we have been expecting, the Habaneros are great fun. 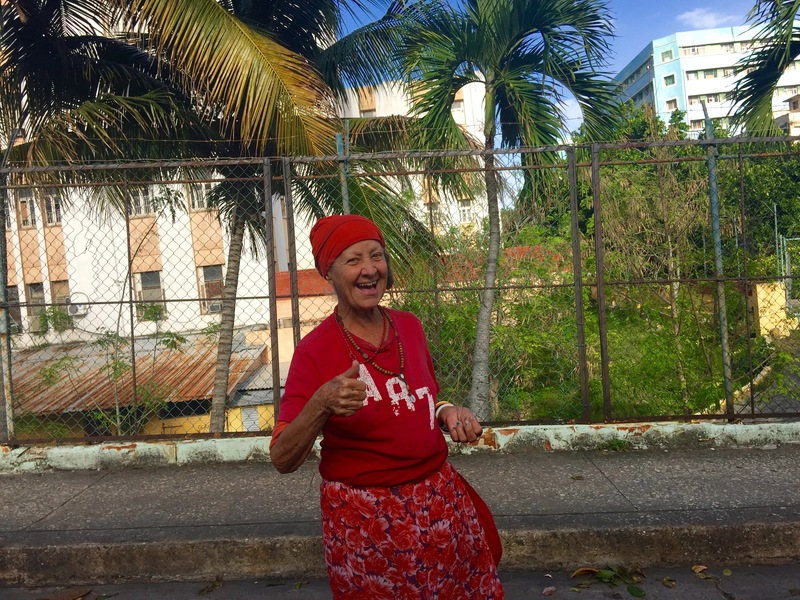 Forget any preconceptions you might have of life under a totalitarian government – Habaneros carry on regardless, with an almost bloody-minded determination to be as happy and unfazed by the problems of everyday life as possible, and it shows everywhere. But when you spy a cigar-chewing guajiro** driving his oxen and plough through a rust-colored tobacco field, you know that you must be within striking distance of Viñales which is our next stop. This slow, relaxed, wonderfully traditional settlement is a place where what you see is what you get – a tiny agricultural town that just happens to occupy one of Cuba’s most beautiful natural corners. The tobacco region of Viñales, and cities of Cienfuegos and Trinidad will be the subject of my next article on Cuba. Previous articleTechnology! Where do I start?